Send Us Nominations for PFI's Board of Directors - Deadline Today! Join us June 24-26 in Myrtle Beach, South Carolina, for the PFI Annual Conference - only 9 weeks away! Last week at the International Biomass Conference & Expo I participated in my first biomass industry association roundtable to discuss the relative strength of our respective industry and the news of the day. I was joined onstage by colleagues from the Biomass Power Association, American Biogas Council, Biomass Thermal Energy Council, and the Renewable Thermal Coalition. The panel provided me another opportunity to talk about Operation 100k, the PFI's strategic initiative to reestablish 100,000 as the annual floor for heating appliance sales. I was preparing my notes that morning and I wondered if it would be possible to calculate what the market would look like had Operation 100k been launched a decade ago and was successful. Very quickly I had a spreadsheet open and was populating cells with sales figures that I found in the June 2017 issue of Hearth & Home Magazine. I then built a formula that would calculate the overage/shortfall in each year. Incidentally, pellet appliance sales eclipsed the 100,000-unit mark just one time in the last 10 years (141,208 in 2008). Even with 2008's overage the shortfall in the years between 2008 and 2017 totals 346,380 units. I then calculated an estimate of lost demand number by assuming pellet consumption for each of those appliances at 2-3 tons/year giving me a range of between 692,760 and 1,039,140 tons. At the average wholesale price of $185/ton that represents between $128 and 192 million in revenue, to say nothing of the $40 - 60 million dollars of margin our downstream retail partners would have generated (calculated from the average retail price/ton less the average wholesale price/ton). Together the total falls somewhere between $170 - 250 million in revenue per year. Our industry cannot afford to let another decade pass with lackluster appliance sales. Our journey towards 100,000 annual pellet appliance sales seems daunting in the face of the numbers from the last 10 years. Nevertheless, this is priority one. Our members operate businesses that need to run at as near to their capacity as possible to maximize their profit potential. Operation 100k recognizes that and puts market expansion right in the middle of what the PFI dedicates itself to. I don't know all of the answers, I'll be the first to admit that, but the more I think about this question of "How do we grow the market for our product?" the more certain I am that it is the RIGHT one to be asking. If this resonates with you at all and you'd like to be a part of our efforts to answer that, I urge you to reach out to me at [email protected] and ask me how to join the conversation. Welcome Back, Michigan Wood Fuels! We are pleased to announce that PFI is welcoming Michigan Wood Fuels, based in Holland, Michigan, back to the association. "We couldn't be happier that Michigan Wood Fuels has made the decision to reengage with the Pellet Fuels Institute," said Tim Portz. "If the PFI is going to be successful in its efforts to grow the market opportunity for our members, we have to have as many producers on board as we can." PFI looks forward to welcoming back other new members as part of our 2018 recruitment campaign. Have any suggestions for outreach? We're all ears - send an email to Tim Portz. Know Anyone Interested in Running for the PFI Board of Directors? The PFI Board of Directors Nominating Committee is looking for nominations for the 2018-2019 PFI Board of Directors. The Board will welcome new members to fill several open seats at its meeting in Myrtle Beach, South Carolina, coinciding with the Annual Conference. All PFI members are encouraged to submit names to the Nominating Committee of people you'd like to see leading PFI. Please send nominations to [email protected] by April 27 for names to be considered. Only 9 Weeks Till the PFI Annual Conference in Myrtle Beach! Register by MONDAY to Get the Early Bird Rate! It's not too early to register for the PFI Annual Conference taking place in Myrtle Beach, June 24-26! The conference is earlier in the summer than in years past, and hotel rooms are already more than half reserved, so don't let it sneak up on you. We're building a collection of photos of our members, their pellet mills and product. Send them to Carrie Annand at [email protected]. 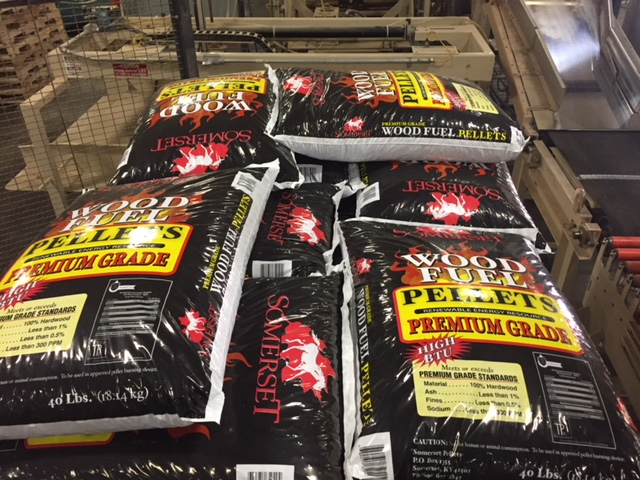 This week's featured photo is from Troy Jamieson with Somerset Wood Pellets. Do You Have News to Share on Pellet Wire? The Environmental Protection Agency says it will treat wood fuels from managed forests as carbon-neutral. It could give New Hampshire's timber industry some long-term certainty. Charlie Niebling has worked around the Granite State's forest products industry for decades. He says scientists have never agreed on if biomass fuels, like wood chips, offset more carbon than they produce. Niebling thinks biomass can have a net carbon benefit if it's harvested from a well-managed forest and burned efficiently. And he says New Hampshire already treats biomass as carbon-neutral, but the EPA's new policy could help the national industry compete with natural gas and other fuels long-term. And he says that means forests will remain undeveloped. Wood energy was among the topics discussed during an April 19 hearing held by the U.S. Senate Committee on Energy and Natural Resources that examined rural energy challenges and opportunities. Robert Venables, executive director of Southeast Conference, discussed the use of wood heating in Alaska during his testimony. Southeast Conference is a federally recognized economic development district for southeast Alaska. The organization aims to develop strong economies, healthy communities and a quality environment in southeast Alaska. "Our vision for southeast Alaska is to reduce, to the maximum extent possible, the use of imported diesel as a primary fuel source for the generation of electricity, space heat and transportation," Venables explained in his written testimony. One success story Venables described is the Southeast Island School District's use of wood energy. In 2007, SISD built two new schools on Price of Wales Island, in Naukati and Coffman Cove, and chose a biomass cordwood system to supply heat. He said the abundant supply of wood and the simplistic nature of operations and maintenance made cordwood heating an attractive option for the schools.